SmartSoft is a component approach for robotics software based on communication patterns as core of a robotics component model. 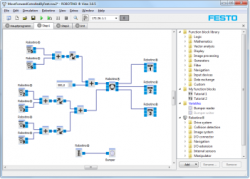 This page describes how one can use SmartSoft together with Robotino. What does SmartSoft and SmartMDSD for you? 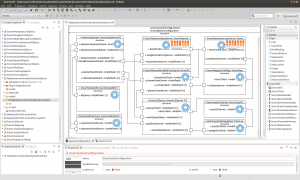 See SmartSoft, the SmartMDSD Toolchain and components in action: Video Tutorials. SmartMDSD toolchain - All information about the toolchain, installation, tutorials, videos, downloads. SmartSoft - The SmartSoft main repository with the core functions and most of the components. SmartSoft - Robotino components - The SmartSoft robotino repository with the robotino specific functions. This section describes the integration or interaction of SmartSoft with the robotino services and tools (API/webinterface/factory). To enable the usage of SmartSoft "standard components" (e.g. 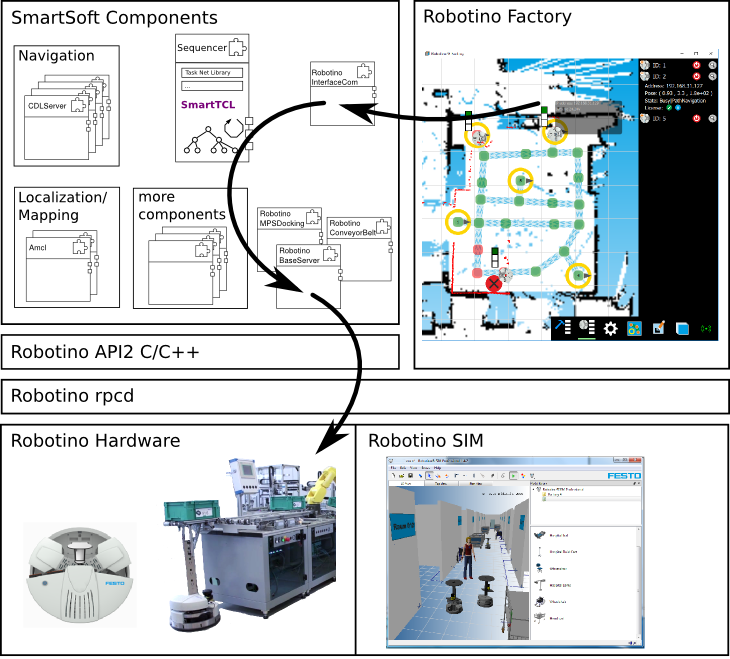 navigation, localization and mapping) with the robotino services e.g the robotino factory, some robotino specific components have been developed (see section below). The combination of those components enables an easy to use interface (e.g. 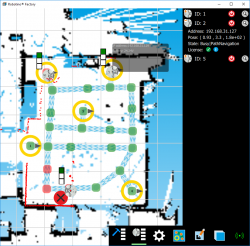 robotino factory) to powerful functionally such as collision free navigation, SLAM, localization, management of locations and maps and tasks. A robot system consist typically of a set of components that makes use of specific hardware (base, laser, etc.) delivering the "basic services" and platform (specific hardware) independent components (e.g. navigation, localization). This section describes those SmartSoft components that are specifically developed for the use with the robotino platform. Other SmartSoft components can and are used in combination with those components as well, e.g. Sick-Laser components, all the navigation, localization and mapping components, etc. .
SmartRobotinoBaseServer The SmartRobotinoBaseServer provides access to the robotino robot. It handles the communication with the hardware or the simulator. It offers several services for controlling the robot, such as sending navigation commands to the base and providing access to the robot's odometry. Position updates can be sent to the component to overcome odometry failures. SmartRobotinoLaserServer The SmartRobotinoLaserServer provides laser scans from the robotino SIM simulator or other scanners operated by robotino deamons. Scans can be requested by push newest or query communication. SmartRobotinoIRServer The SmartRobotinoIRServer ir scans from the robotino platforms (and simulator). SmartRobotinoRPCBridge The SmartRobotinoRPCBridge component is the interface component between the the robotino rpcd and the SmartSoft components. It is used to transfer data between the two system parts, e.g. the map as it is recorded by the SLAM component. SmartRobotinoImageServer The SmartRobotinoImageServer provides images captured by a robotino daemon or the simulator. SmartFestoFleetCom The SmartFestoFleetCom is the interface component to the FESTO Fleet-Manager (MPS). SmartFestoGripperServer The SmartFestoGripperServer provides access to the FESTO gripper for Robotino3. SmartFestoMPSDocking The SmartFestoMPSDocking performs the docking/undocking of a Robotino3, equipped with a conveyer belt, to a FESTO MPS station. SmartMarkerTracker The SmartMarkerTracker is capable of detecting visual markers and docking to MPS stations equipped with visual markers. SmartNavigationPlanner The SmartNavigationPlanner uses ompl to perform planning for navigation. The component is used in the context of corridor based fleet navigation. SmartPurePursuitNavigation The SmartPurePursuitNavigation realizes a pure-pursuit navigation, calculating velocities to follow a trajectory. SmartRobotinoBatteryChargerDocking The SmartRobotinoBatteryChargerDocking performs the docking/undocking of a Robotino3 to a battery charger station. SmartRobotinoConveyerBeltServer The SmartRobotinoConveyerBeltServer provides access the robotino3 conveyer belt, used to transport KLTs (small load carrier). SmartRobotinoMasterRPCBridge The SmartRobotinoMasterRPCBridge is the interface component between the the robotino rpcd and the SmartSoft components. It is used to transfer data between the two system parts, e.g. the map as it is recorded by the SLAM component. This component is among the set of fleet coordination components. SmartPathNavigationServer The SmartPathNavigationServer is the coordinating component for corridor based local coordinated navigation with multiple robots in a fleet. SmartPathNavigationClient The SmartPathNavigationClient is client component for corridor based fleet navigation. This page was last edited on 20 June 2018, at 09:24.